This luscious soup has earthy tones of sage and white beans and is guaranteed to make any tummy warm and yummy. 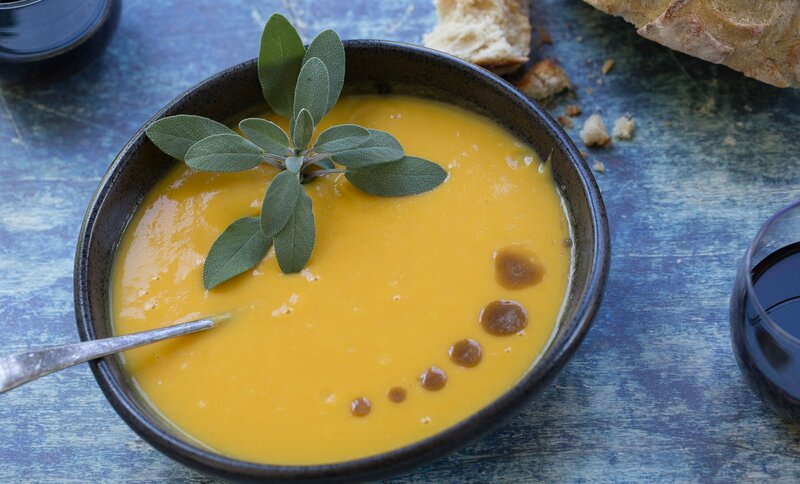 Toss the butternut squash in a bowl and add the garlic cloves. Add a couple of turns around the bowl of olive oil and a dash of salt and place it in a baking tray and pop it in the oven. Cook until soft, at which point your kitchen will smell great. Practice your knife skills and dice the onion and celery. Again, a couple of turns around a medium-sized pot of olive oil and add these veggies to the pot once the oil is heated. Place over a medium heat and allow the veggies to “sweat'”, that is, turn translucent as they cook down. Once they are soft, add the roasted, garlicky squash and add enough water to cover the veggies plus an inch. You are now ready to blend! Blend in batches in a mixer until smooth. Transfer back to the pot, add the cannellini beans and sage. Season generously with salt and pepper, and bring up to a nice hot temperature, over low heat. Delish!